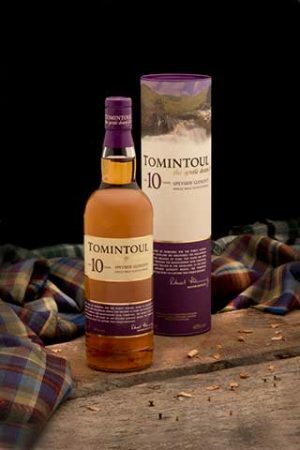 Tomintoul Aged 10 Years has been lovingly crafted from a selection of the finest bourbon casks, each aged for a minimum of ten years. "Enveloping and warm. Velvety. Cream fudge. A lot of spices. Nutmeg, cinnamon, pepper" "sweet, honey, floral, pepper, wood, spices, toffee, apples"
Produced at Tomintoul Distillery, "Old Ballantruan" Single Malt Scotch Whisky is one of only a handful of heavily peated malt whiskies from the Speyside region. After maturing for many years in hand-picked oak barrels, this whisky was bottled at 50% abv, non- chillfiltered, to retain its layered and integrated peaty / smoky flavours. It has a peating level of 30 ppm. 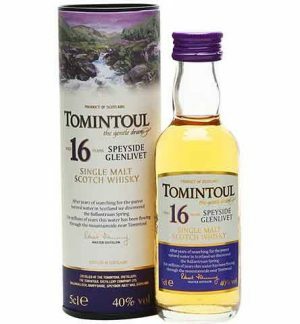 "The finish is vibrant and long with a lovely combination of the obvious smokiness, sweet caramel, vanilla and some wood spice"
"This is a stunning example of the work being done at the Tomintoul distillery"
The Speyside distillery of Tomintoul has added a 14 yr expression to its line up. "fresh and fruity on the nose, with ripe peaches and pineapple cheesecake, delicate spice and background malt. Closer to barley sugar with the addition of water. Medium-bodied, fruity and fudgy on the palate. The finish offers wine gums, mild, gently spiced oak, malt and a suggestion of smoke" (whisky-pages.com) Bottled at 46% abv, at its natural colour with no chill-filtering, which helps to bring out more of the flavour, and the character of the dram. 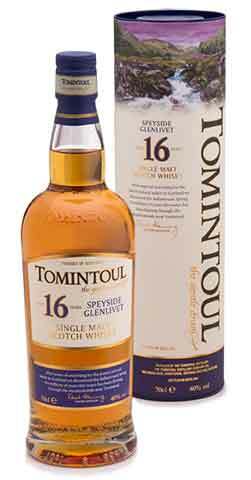 Multi-award winning Tomintoul Speyside Glenlivet Single Malt Scotch Whisky Aged 16 Years has been lovingly crafted, from a selection of the finest bourbon casks, each aged for at least sixteen years. "Fruity concoction of apples and pears topped with vanilla ice cream… one of the noses of the year. Soft, indeed every bit as gentle as the label promises, as the light oils coat the palate with a fabulously intense and delicately sweetened barley skin. A wonderful, multi-layered interplay between malt and oak-vanillas… hugely sophisticated." Produced at Tomintoul Distillery, "Old Ballantruan" Single Malt Scotch Whisky is one of only a handful of heavily peated malt whiskies from the Speyside region. After maturing for a minimum of 10 years in hand-picked oak barrels, this whisky was bottled at 50% abv, non- chillfiltered, to retain its layered and integrated peaty / smoky flavours. It has a peating level of 30 ppm. 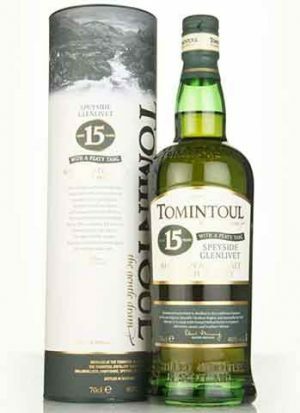 Tomintoul, 15 year old Peaty Tang, is a new age statement addition to the range. Matured in American oak ex-Bourbon barrels. 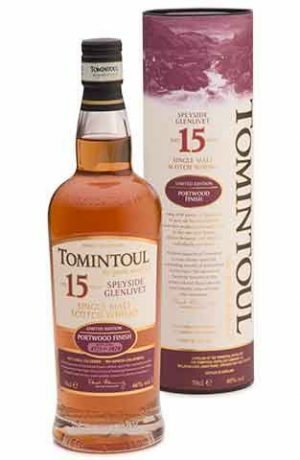 Tomintoul 15 Years Old Portwood Finish has been created by the careful selection of mature whisky “finished” in Port wood. The malt whisky was transferred from Bourbon casks into the hand-picked Port pipes to “finish” its maturation. This process of “finishing” bestows on the whisky refined characteristics, most notably, tones of fruity Port sweetness. Their Master Distiller deemed that the time was right to bottle the whisky at 15 years of age when the malt whisky flavour notes had reached harmony with the sweet attributes of the Portwood. Each bottle individually numbered. 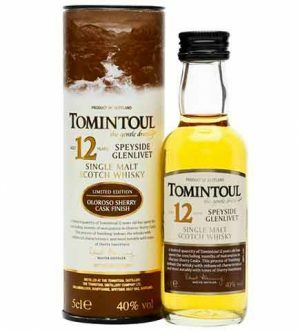 Released in mid 2017 - Tomintoul Speyside Glenlivet Single Malt Scotch Whisky aged 21 years, has been crafted, from a careful selection of the finest mature whisky from bourbon casks, each aged for at least twenty-one years. 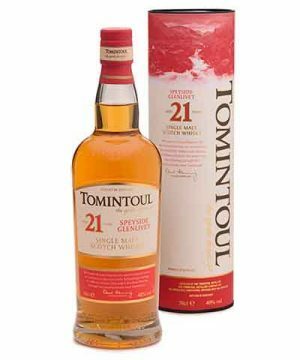 "oh thats a lovely dram, mixed fruit salad and vanilla sugar with cloves and some oak and a touch of dark chocolate cocoa powder" "This 21 year old is a cracker of a dram and at a very reasonable price"
Added to the Tomintoul range in 2015, this 25-year-old would have been distilled when the distillery was owned by Whyte & Mackay. 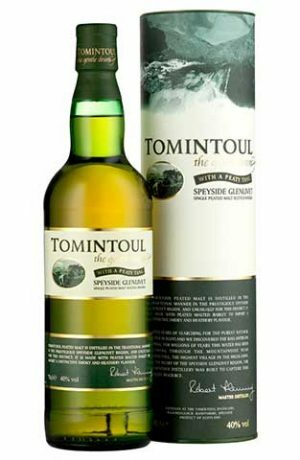 This Tomintoul Speyside Single Malt Scotch Whisky has been lovingly crafted, from a selection of the finest bourbon casks, each aged for at least twenty-five years. 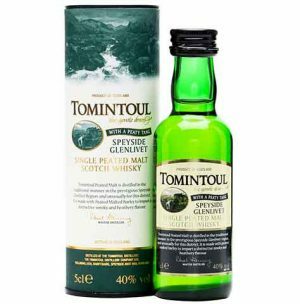 Pure ingredients and the natural environment add to the smooth and mellow character of the award-winning Tomintoul Speyside Single Malt Scotch Whisky, “the gentle dram”. 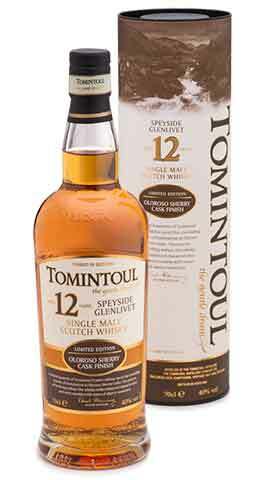 Rare editions of Single Cask Tomintoul are released from time to time and each cask is usually aged between 25 and 40 years old. Between 150 and 500 bottles are typically produced from any one cask. Each bottle is individually numbered and the cask number, the date of distillation and bottling are recorded on the label. 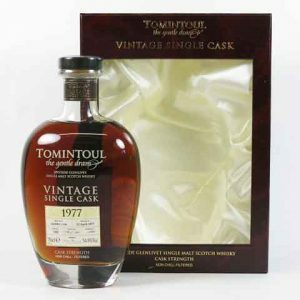 This is the Tomintoul Single Cask Malt Scotch Whisky 1977 Vintage, taken from the most superb Sherry cask, handpicked by Robert Fleming, the Distillery Director. 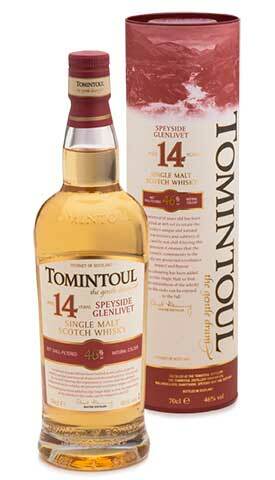 Only 470 bottles have been produced from this one cask at 54.9% abv. Distilled 12 April 1977, bottled June 2015. 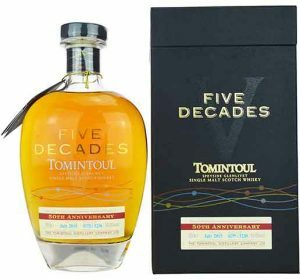 "A rich and complex sherried whisky"
Tomintoul Distillery has released a very special and unique product, The Five Decades, to commemorate the 50th anniversary of Tomintoul Distillery, which started distilling in 1965. Individual casks have been chosen to represent the flavours from 50 years of craftsmanship at the distillery. Master Distiller, Robert Fleming, has personally selected casks from 1965, 1975, 1985, 1995 and 2005 and has overseen the marrying of these superb malt whiskies. “The reason why we chose these particular casks is that they represented unique flavour characteristics from the five decades and moreover when married together they have produced a product of great distinction" Bottled at 50% abv, only 5230 individually numbered bottles released worldwide. 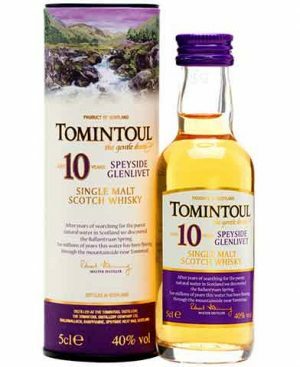 "Tropical fruit, nuts and spice"
Pure ingredients and the natural environment add to the smooth and mellow character of this award-winning Tomintoul Single Malt Scotch Whisky, "the gentle dram". 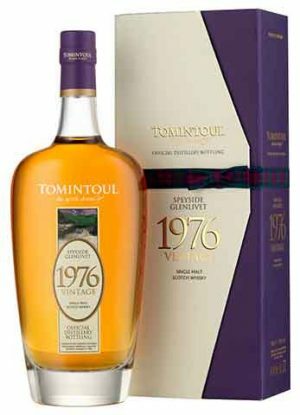 Limited Edition Tomintoul Speyside Glenlivet Single Malt Scotch Whisky 1976 Vintage demonstrates the results of an exceptional year of distillation. "I consider this whisky to be a jewel amongst single malts and of the finest to have been released in Scotland" Robert Fleming, Distillery Director. 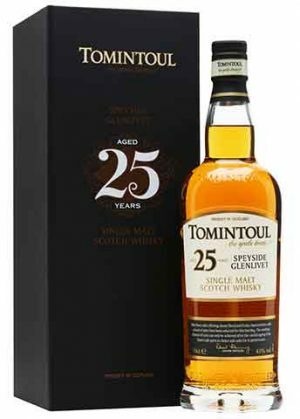 Rare editions of Single Cask Tomintoul are released from time to time and each cask is usually aged between 25 and 35 years old. Between 150 and 500 bottles are typically produced from any one cask. Each bottle is individually numbered and the cask number, the date of distillation and bottling are recorded on the label. 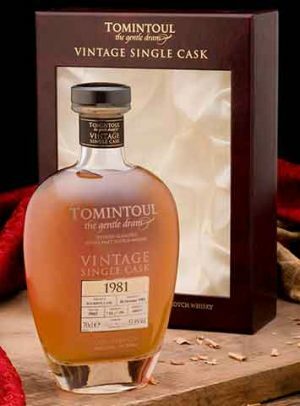 This is the Tomintoul Single Cask Malt Scotch Whisky 1981 Vintage, taken from the most superb Sherry cask, handpicked by Robert Fleming, the Distillery Director. Only 180 bottles have been produced from this one cask at 50.5% abv. Distilled 30 October 1981.